Inside: Keep reading to learn how to make an extra creamy, Mexican-style Arroz Con Leche that everyone will love! 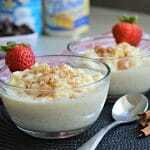 Arroz con Leche, or rice pudding, is an authentic Mexican recipe that is sweet and smooth. If you master the steps to make this delicious dessert, you will come to realize that rice is not only good as a savory meal, but also as a sweet one. Today I am going to share the secrets about how to make a delicious, yet easy arroz con leche that I learned from my abuelita. A little while back, we had guests coming to our house for dinner, and even though we had planned everything in advance, the day got away from me and we had to change the menu at the last minute. Fortunately, dessert was an easy decision, because I knew that I could make this amazing arroz con leche, which is commonly translated to “rice pudding” in English. This recipe is very important to me because it always brings back some of my favorite memories of growing up near my abuelita’s ranch in Mexico. She was the most amazing cook, and she always snuck me into the kitchen to help her. Sometimes that meant that I was just licking bowls, but it was always a great time. I always loved observing her while she cooked and listening to all of the great stories she told me about when she was growing up. I definitely learned so much about life and being a good person from her during the time we shared in the kitchen! Whenever she cooked rice pudding, we all waited anxiously for it to be done so that we could enjoy it. TIP 1: Toast the Cinnamon Sticks and Cloves First. My abuelita always started by lightly toasting the cinnamon sticks and two or three cloves until there was a delicious aroma in the air. I still use this trick to this day and it makes a big difference in this recipe. 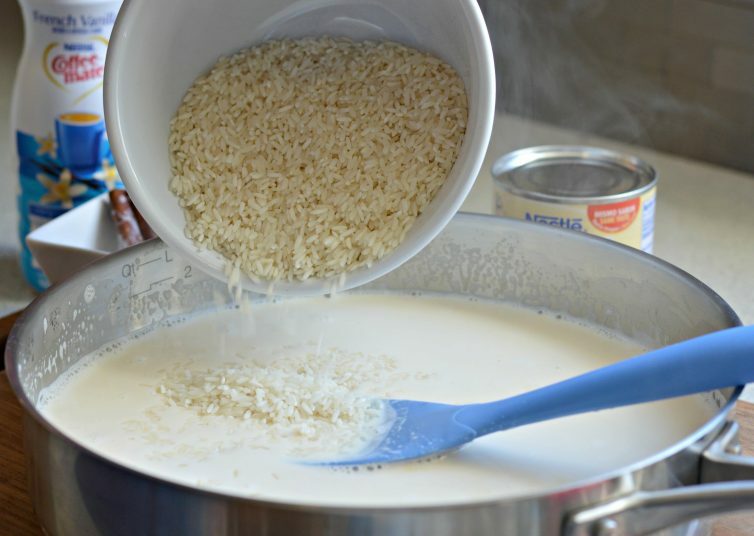 TIP 2: Add Evaporated Milk to the Water when Cooking the Rice. After toasting the cinnamon and cloves, my abuelita taught me to add not only water, but also evaporated milk with the rice, so that it could cook together and so that all of the flavors could combine perfectly. TIP 3: Use Sweetened Condensed Milk And Liquid Coffee Creamer. It is common to use sweetened condensed milk in arroz con leche, but my Abuela taught me that adding some liquid coffee creamer can add a perfect amount of sweetness and creaminess that everyone loves. TIP 4: Make It With Love. All of the other tips I have mentioned have to do with the ingredients and how you prepare them. However, one of the most important lessons I ever learned from my Abuela was to make everything with love. Making it with love means that you take your time with every step, keeping your family in friends that will be enjoying it in mind. How Do You Serve Arroz Con Leche? After you finish making the base of this arroz con leche, it is time to make it look pretty. I always like to serve it in glass bowls and topped with cinnamon and fresh fruit. Other cultures prepare rice pudding in different ways, but this is my favorite. You can add almonds, raisins, or any fresh fruit that you have on hand. No matter how you serve it, I am sure that you will enjoy it. If you try this recipe and love it, please come back and let me know in the comments below. And as always, if it was good, don’t forget to leave a 5-star review! 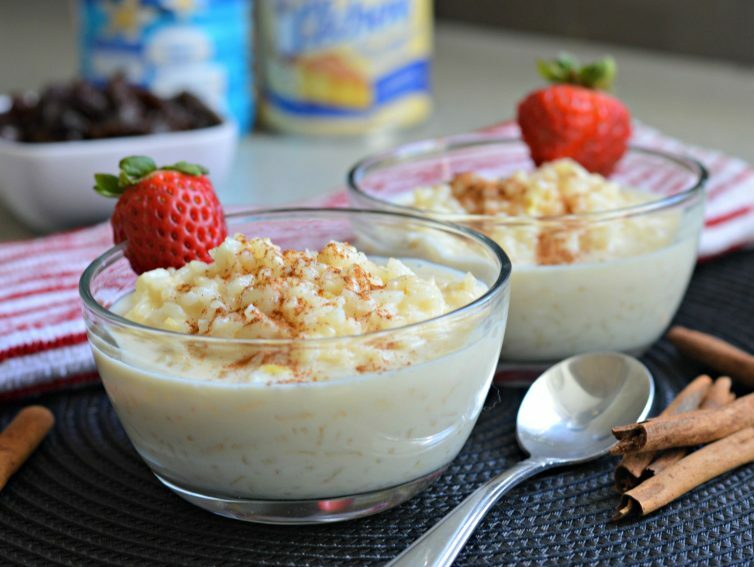 Arroz con leche (rice pudding) is one of the easiest and most delicious Mexican desserts. Begin by toasting the cinnamon sticks and cloves until you can begin to smell them. Add the water, evaporated milk, rice, milk, and butter and cook over medium high heat. Bring to a boil and bring to a simmer, stirring occasionally until the rice is cooked through and liquid is almost completely evaporated (20-30 minutes). 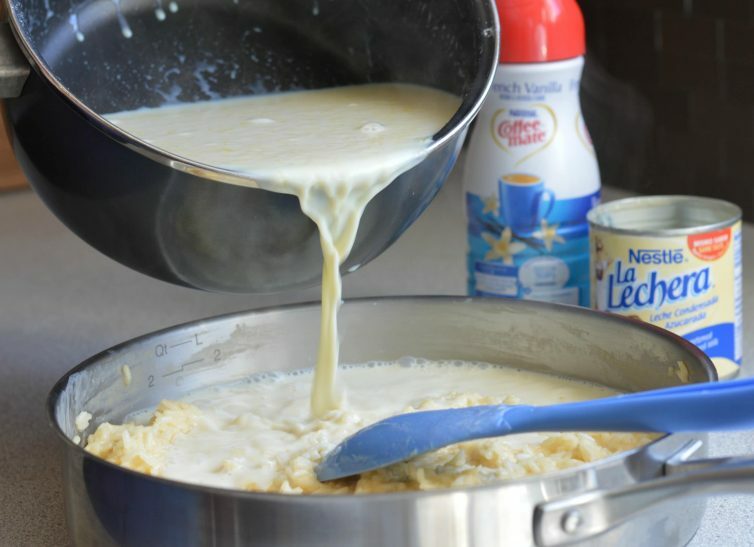 In a separate pot, combine the Coffee-Mate Liquid Creamer with the La Lechera sweetened condensed milk and stir well. Bring to a boil for two minutes and add the egg yolks, stirring rapidly with a whisk. Let boil for two additional minutes until it has thickened. Add this mixture to the rice mixture and stir well. Add raisins, nuts, or fruit. 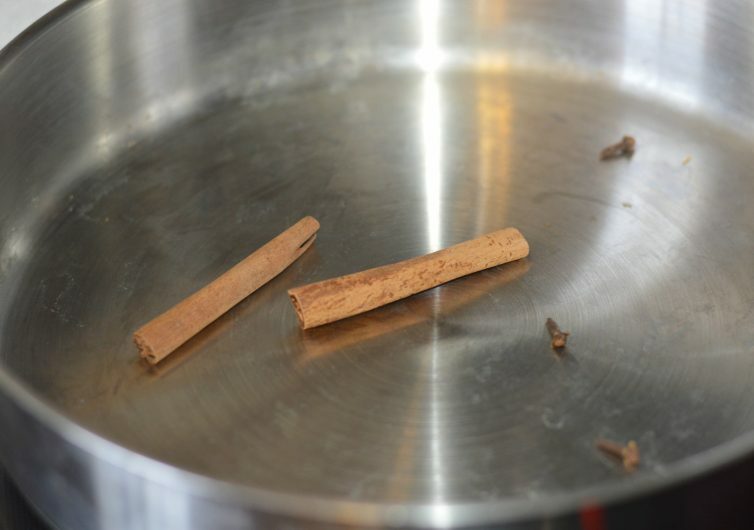 When do you take out the cinnamon sticks and cloves or do they dissolve while cooking? Hi! You should take it out shortly after the water begins to boil. Thanks for pointing that out. I will update the instructions. Have a great day! The main purpose is to provide extra richness, and it also acts as a thickening agent. Good luck! How much of the creamer do i use? Thank you! I am always eager to try different recipes so when I came across this recipe i knew i had found the golden ticket My family & I are just cant get enough of your abuelitas creamy arroz con leche!!! The creamer is like the icing on a cake as for the eggs it’s very different but delicious! Although I’m not sure what the eggs do? But I just love it Thank you so much for sharing this with us! —-Quick question tho-when doing the egg do I put it in with the creamer or with the rice then add the the creamer and stuff?